When Google launched Google+ Sign-In earlier this year, all of a sudden Google+ could do things that Facebook couldn't. As users gained the ability to connect their Google+ account to other apps and services, Google instantly had a mobile advantage over Facebook, call-to-action buttons, ability to integrate other Google products and selective sharing. Now the search engine is extending the usefulness of G+ Sign-In to its search results, it announced on Tuesday. Users' activity within apps while signed into Google+ will now inform Google search of what's hot, the most popular audio files on SoundCloud, for instance, or the best reviewed movies on Fandango at any given time. 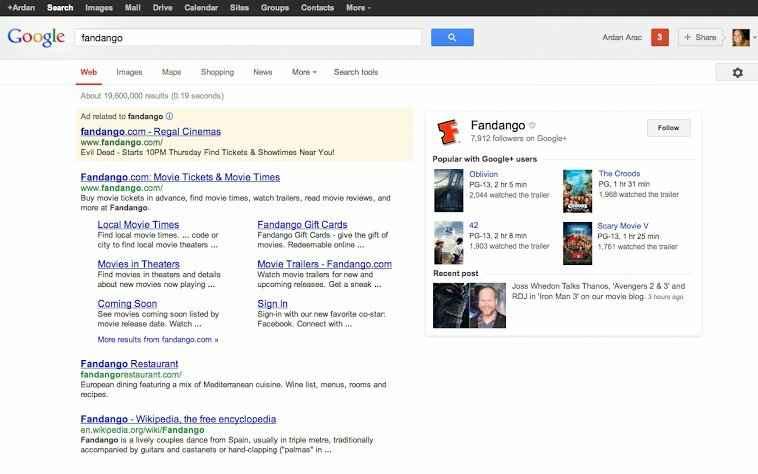 Both SoundCloud and Fandango are launch partners for the use of aggregate app data in Google search. And here's how it will look when Sign-In app integration officially launches. 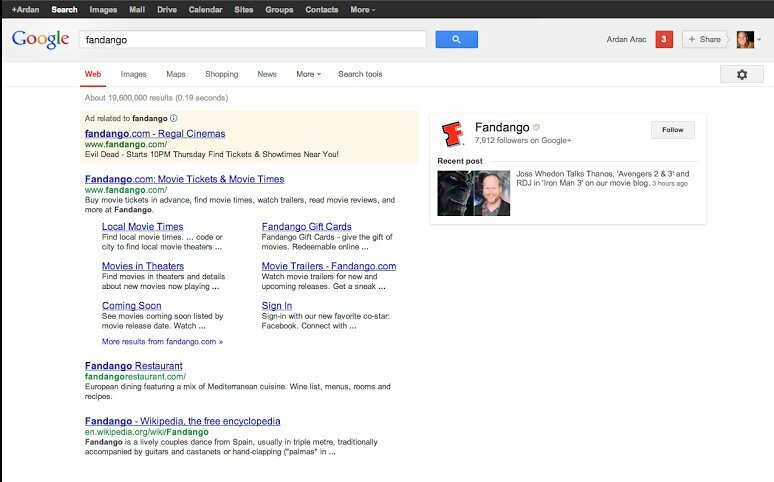 Note that the Fandango box on the right side includes the most popular movies as reviewed by Google+ users in the Fandango app. Google+ Director of Product Management Seth Sternberg wrote in a blog post about the new functionality, "We're rolling out this feature in desktop Search over the next few weeks, starting with a limited number of music and movie apps." Additional apps will be supported over time. Drew Olanoff wrote for TechCrunch that the news is hardly surprising: "Google's No. 1 strength is its search product, so it makes sense that all of their products feed back into it somehow." ZDNet's Ben Woods added that the move "reflects Google's desire to grow its social network to compete with the more popular Twitter and Facebook," encouraging more developers to integrate Google+ into their apps. There's no question that this new feature improves Google search with compelling, timely information from the crowd, while also providing another boost for Google+ in terms of visibility and usefulness. Sounds like a win-win for Google and a win for users too.